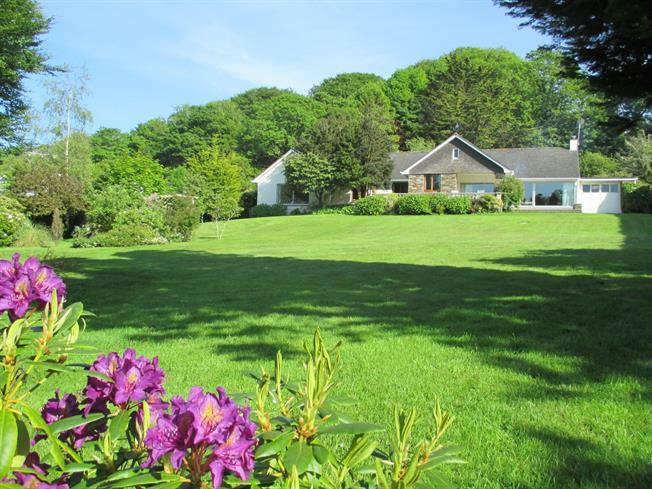 5 Bedroom Detached For Sale in Falmouth for Guide Price £1,395,000. A very private residence occupying an enviable creek side location set in formal gardens. The property has approximately 55 metres of direct frontage onto the creek including the foreshore and with a granite quay slipway. This is a rare opportunity to purchase a delightful property in a very private and exclusive location with direct frontage onto Port Navas Creek, which is a branch of the Helford River. Located on Anna Maria Lane, where houses rarely become available due to the select location, it is ideal for anyone wishing to have direct access to the river for their boats. The property is a single storey residence which currently consists of 5 bedrooms, 3 reception rooms, integral double garage and an attached boat house to the side of the property. The spacious entrance hall leads you down the centre of the property with the sleeping accommodation all on your right and the living accommodation on your left. Entering the kitchen from the hallway, your eyes are drawn through the double doors, across the dining area and the terrace beyond to give you an immediate delightful view of the creek which makes this property so special. The kitchen has a range of wall and floor mounted units providing copious storage. It is open plan to the breakfast room which is awash with morning light, facing the front elevation and with French doors leading out onto a covered patio ideal for morning coffee in the sunshine. The formal sitting/dining room is an expansive 'L' shaped room with a Bath stone open fireplace providing a focal point and large picture windows all along the rear elevation making the most of the glorious views across the garden to the private waterfront and the creek beyond. These views are shared by the study which opens off the dining area. There are 5 bedrooms, the master bedroom being of particular note at approx 19' x 15' with a large en-suite bathroom including a corner bath and separate shower cubicle. The family bathroom and separate toilet serve the remaining bedrooms. Completing the accommodation is a utility room providing internal access to the double garage, plus an outside door to the enclosed side garden. An impressive loft area spans virtually the whole foot print of the property, ideal for creating further accommodation if converted (subject to permissions). Externally the property is approached by a sweeping drive that leads to the integral double garage and additional parking for multiple vehicles. The gardens are extremely well maintained and stocked with a variety of mature shrubs and trees. Along the rear of the property, and accessed from both the living area and master bedroom, is a paved terrace, partly bounded by a low balustrade, offering stunning views of the creek. The gently sloping rear garden is mostly laid to lawn and stretches to the water's edge, with steps leading to a walkway along the frontage to the private quay. The property owns to mean high water and has a granite quay and slipway with electric power and water. The total frontage is approx. 55 metres and has 2-3 metres of water depth at high tide and a 4 point chain drying mooring for yachts up to 40 feet. Attached to the house is the boat house large enough to store boats up to 20 feet in length. The boat house is fitted with an electric winch for hauling trailered craft from the slipway into the boat house. The moorings are suitable for any craft that is capable of grounding with a lifting keel, bilge keels or a fin keel and the use of legs. Deep water moorings are available nearby in the Helford River. The Helford River remains one of the most beautiful and least disturbed estuaries in the country. The village of Mawnan Smith is just over a mile away from the property and provides a local convenience store, primary school, doctors surgery, and regular bus service to Falmouth, whilst the Ferry Boat Inn is popular with residents and tourists alike, with its stunning views across the waters of the Helford Passage, and access to the nearby coastal footpath. The town of Falmouth lies approx. 4.5 miles to the south west and remains one of the most popular towns in Cornwall which is steeped in maritime history and has, reputedly, the third largest natural harbour in the world which handles commercial shipping and recreational sailing alike. There are many attractions to be enjoyed locally with Pendennis Castle and The National Maritime Museum leading the way plus a wide variety of shops and galleries in the town centre. The Combined University Campus at Tremough links with the existing colleges at Falmouth and brings to the area a wealth of opportunities both educational and commercial. The following services are available Mains electricity Mains water supply, private drainage, oil central heating and telephone connection although we have not verified this.